Guillermo del Toro cranks things up for the Hellboy sequel which really scores with an amazing visual style and some stunning creature design. Del Toro this time brings a faster and more even pace to this one, as well as, a story that is a bit more Brothers Grimm than Lovecraft and that helps lighten the tone a bit, too. There’s a little more humor (Hellboy and Abe drunkenly singing Barry Manilow is sidesplitting), but the film never gets silly. 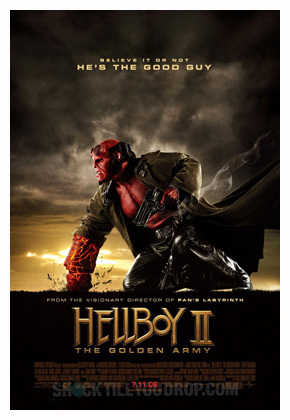 The story this time finds Hellboy (Ron Perlman) outing himself to the general public while a noble but vengeful elf prince, Nuada, (Played with dignity and strength by Luke Goss) plans to resurrect the mythic Golden Army to rid the world of mankind, so the creatures of fairy can return to their former glory. His twin sister, Nuala (Anna Walton) tries to thwart his efforts at genocide and allies herself with Hellboy and the team to protect pieces of a golden crown which can resurrect and control the goblin-made mechanical army. Can Hellboy defeat this powerful elven prince in order to protect the very humans who now seem to reject him, despite all he’s done to protect them? Del Toro stages some absolutely beautiful set pieces with his trademark sumptuous visually style and design. Highlights of the film being The Troll Market scene and the following sequence featuring a giant plant elemental battling our heroes by the Brooklyn Bridge. They alone are worth the price of admission, not to mention the climactic battle against the Golden Army itself. There is an amazing assortment of supporting fantasy creatures that are incredibly designed and rendered and are worth the price of admission as well. Once again the mix of practical and CGI FX is truly breathtaking and elevate an already very entertaining film. The cast are mostly all back except, Doug Jones now voices Abe himself and Agent Myers is absent. There is also new team member Johann Krauss, an ectoplasmic gas in a diving suit voiced by Seth MacFarlane, who butts heads…or glass bubbles…with the loose cannon, Hellboy. Not only is Hellboy 2 a bigger and faster paced supernatural action flick, but it is a visual feast for the eyes and just plain loads of fun. A sequel that exceeds and improves on the entertaining original. 3 and 1/2 (out of 4) Hellboys! In my opinion Blade II is the best of the Blade series and is certainly my personal favorite in the comic book-based trilogy. 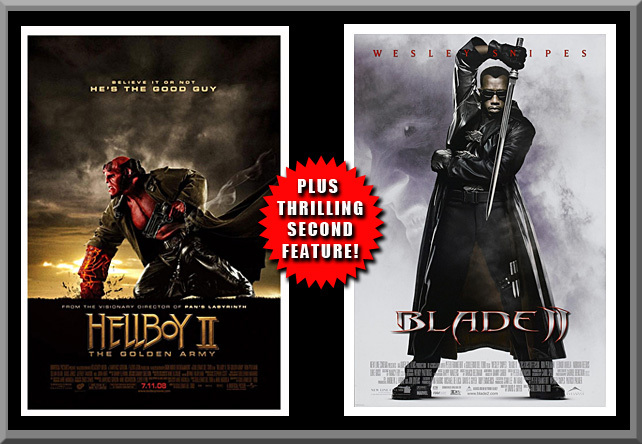 Second adventure of the half human, half vampire hero Blade (Wesley Snipes) finds him hunting down Whistler (Kris Kristofferson) who has been taken and turned by the vampires. Upon finding him and using his serum to effect a cure, Blade is contacted by the vampire hierarchy…and asked for help. It seems a vampire mutation strain has evolved creating vicious creatures called Reapers, who hunt vampires much like they hunt humans. The vampires’ reasoning is that once the vampires are wiped out by the rapidly multiplying Reapers, they will turn on the humans that Blade protects. Why not work together to destroy a common foe? Now the vampire slayer must join forces with his mortal enemies in order to defeat a threat that makes even vampires afraid of the dark…but can he trust his new allies? As directed by Guillermo del Toro, Blade II has a great visual style, some fierce, gory action, a cool cast of supporting characters, along with a nasty and very effective foe in the Reapers. Where the first Blade was an action film with horror elements, Blade II is a horror film with lots of action…win, win! Under Del Toro’s guidance, the cast all bring vivid life to their comic book-style characters. 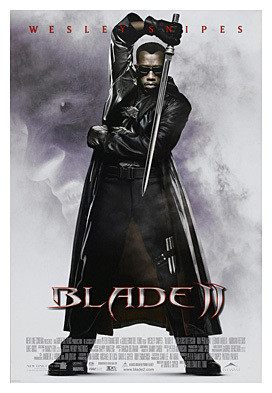 Wesley Snipes really takes control of the Blade character at this point, no more evident than in the scene where he first meets ‘The Bloodpack’, a team of vampire commandos who’s sole purpose is to kill him, but now must work with him against the Reapers. “Can you blush?” Luke Goss is fierce and yet noble as the Reaper leader Jared Nomak, a monster with some interesting secrets. Kris Kristofferson is cantankerous, as always, as Blade’s partner, mentor and weapon’s maker, Whistler. Leonor Valera is the beautiful Nyssa, a vampire aristocrat and warrior who steals Blade’s heart, despite being of a species he’s sworn to destroy. And Ron Perlman is effective and entertaining, as usual, as Bloodpack member Reinhard who is not happy with Blade as an ally and would love to take him down first chance he gets. Blade II is a really fun flick and gives us some great and gory action set pieces, as when Blade and The Bloodpack take on the Reapers in a vampire night club, again in the catacombs underneath the city and finally, the climactic three-way showdown between Blade, Nomak and some double crossing vampires in the vampire stronghold. A really fast paced, delightfully gory and very entertaining action/horror with Blade at his best. Also stars Norman “Daryl Dixon” Reedus as Blade’s new sidekick, Scud and Hong Kong legend, Donnie Yen…who also choreographed the fight action…as Bloodpack member, Snowman. A really good movie and the best of this fun and far too short-lived series. 3 and 1/2 (out of 4) fangs! ← MONSTERZERO NJ’S 15 IRISH HORRORS TO WATCH ON ST. PATRICK’S DAY!